Wake Radiology is recognized as a leading provider of outpatient medical imaging for adults and children in the Triangle of North Carolina for over 60 years. In this time, Wake Radiology has maintained a strong brand identify that has provided a steadfast image for its employees and patients. With a upcoming retirement of one of its founders, Wake Radiology capitalized on the opportunity by re-imagining their brand. Through the leadership of it’s interim Marketing Director, a team of experts were tasked with the creation and implementation of its brand launch in a 5-month turnaround. IONA presented digital design concepts in Q1. aWith full support, IONA was given the go-ahead for implementation and launch by first part of Q2. 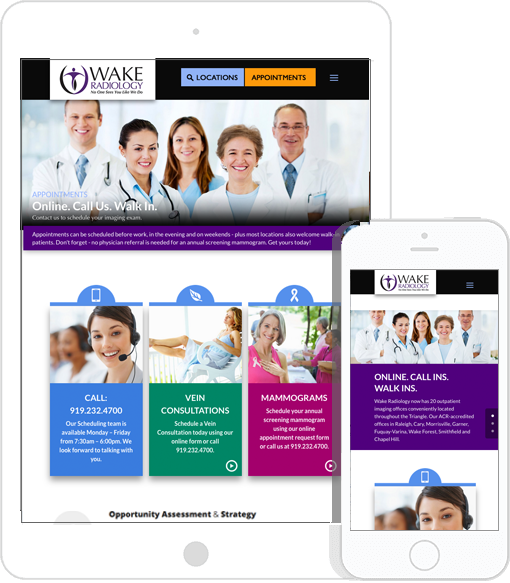 With a short turn-around, IONA called upon the team of experts to providing branding assets, SEO consulting, and writing expertise, to create Wake Radiology’s consumer site WakeRad.com. Through the use of the latest best practices in web development, IONA created a digital environment that is fully responsive, conversion focused, and message minded. IONA created custom content management tools to offer administrators the ability to manage multi-media easily and quickly. Through the use of a robust asset management system, administrators are able to easily access a variety of media that is shared between the consumer and portal spaces. As the brand unfolded in early 2015, the work of a brand is never done. IONA currently works with Wake Radiology as a consultant and team member to continue to achieve the objectives of a strategic road map to brand success. Through extensive competitor analysis, IONA helped to define the marketplace which Wake Radiology competes. By clearly defining best practices, direct competitors, and industry specific comparable organizations, we easily gleamed the benchmarks for which we could define success. Through the latest in responsive design and development, IONA created a site that offers a user friendly experience and conversion every step of the way. Through intelligent content management best practices, IONA created the easiest of tools for Wake Radiology to manage the site’s desktop, tablet, and mobile site in one location with little to no customized management of the platform. 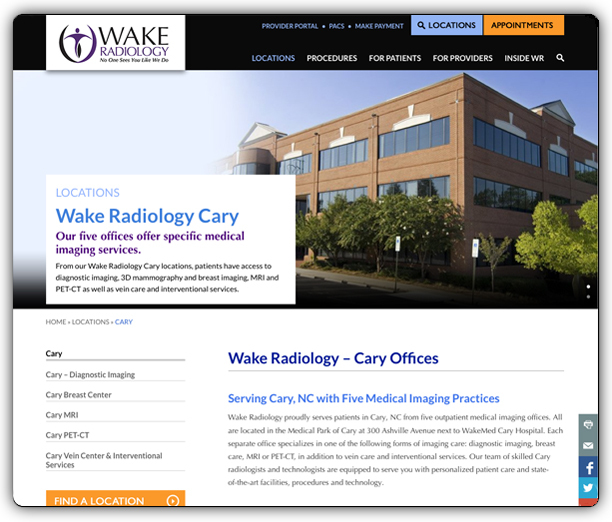 Through the collaboration of Wake Radiology’s marketing manager and external project manager, branding team, SEO, and IONA, the launch of a new Wake Radiology brand was clearly defined and articulated through all mediums including radio, TV, billboards, online experience, events, and sponsorship. 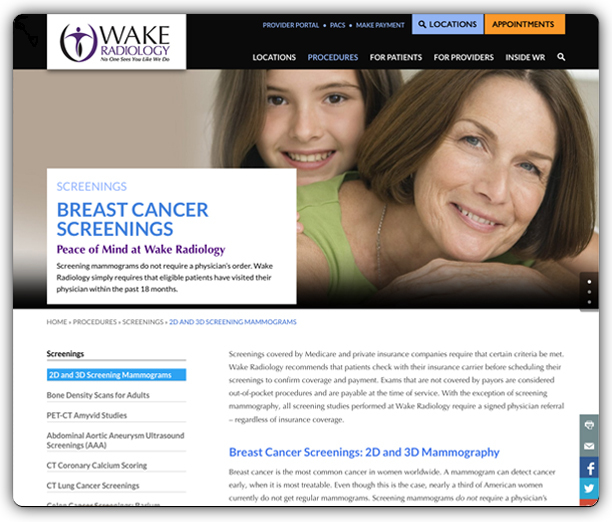 The Wake Radiology newly designed, responsive site serves as a launch pad for extending its digital capabilities and interacting with patients.Within a short planning and development time, success was achieved by clarifying the Wake Radiology digital position, presenting a unified brand through various mediums, providing real time statistics of users, and introducing cross platform marketing to the Wake Radiology culture.